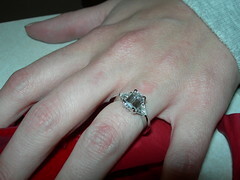 So if you haven’t heard yet, Ashley and I got engaged last night. Everyone keeps asking for details, so here we go. On Valentines Day this year, Ash decided to play a little joke on me. You see, the pressure has been building from all directions and many have joked that I would never propose – all were saying she is going to have to be the one who makes the proposal. This set the perfect groundwork for her prank. 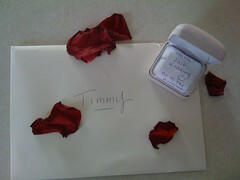 She had raced home on her lunch break and staged a scene in our kitchen with a ring box placed amongst rose petals. She then called me with perfect timing as I was getting home on my lunch break. She gave me instructions to go look in the kitchen. I saw the setup, and froze. Mind racing. “No. Way. Did she really do this? I thought we talked about how she wouldn’t propose because she didn’t want to be deprived of that moment?” Etc, etc, like I said, racing. “Open it” she says with piles of excitement in her voice. Inside I find a note that says “Ha ha! Just kidding, go in the bathroom”. Which sounds odd, but that’s where she put my real present. (incidentally a dog-poop scoop. Yeah, she’s a keeper.) She got me good. We’ve talked a lot about when it would happen and how it would happen etc. I’d come to the conclusion that the only way I would surprise her is to just pop the question on some random day. Over the past few years, her friends would call and say things like “Christmas is coming up, do you think he’ll propose?” or “it’s arbor day do you think he’ll propose?”, you get the idea. Relentless. Constant. Every day, everything we did together became a day of suspicion. If I don’t answer my phone, “maybe he’s buying me a ring” would run through her head. I took the punishment, the digs, the Sunday Bridezilla marathons on the WE channel… all the while behind the scenes I’m saving my money for the ring. And later going through the arduous task of getting the ring made, made just right, shipped from New York. It’s hard to keep a secret, let alone a secret that big for that long when you’re asked daily when it’s going to happen. My plan was to return the favor, set the same scene, and make her sweat a little. I tore the house apart and found that exact same ring box she used on me. 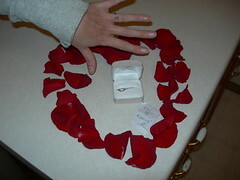 I picked up a dozen roses and placed the petals on the table, with the real ring inside her old junky ring box. I wrote a note that said “I’m NOT kidding!” and closed it inside, with the ring. She had just worked a 15 hr day. Thursday nights we have a ritual. When she is nearly home from work she’ll text me a message of “go see”. This is so I can tell Tucker to “go see” out the window and watch her drive in. By now, Tucker knows this, knows my text message ringtone, and now runs to the window to watch her drive in for ever text I get. So, thanks to her traditional heads up, I knew when she would be home and had time to collect myself. I didn’t want to blurt out “RING” the second she walked the door. “Hey babe, how was work” I mustered out, trying to hide my nerves. “Do you want to have a glass of wine with me?”. “No I’m tired” she replied – as I knew she would after the long day. She then walked around the corner into the kitchen and saw the setup. “If this is a f#*@ing joke it is not funny! !” she said, giving me the look. “It’s no joke” I said. She was frozen, shaking, crying, hyperventilating… all around freaking out. She was too scared to open the box. So, I picked it up and said again “it’s not a joke”. I opened the box… she sees the “I’m NOT Kidding” note, but it’s still not sinking in. She’s just standing there, crying, putting her hands over her face. Blubbering. I then got down on one knee and asked her to marry me. I get nothing but sobs and oh my gods. No answer. So I press harder, “babe, have you got an answer?” “DUH!! !” she replies through the sobs. “That’s not reeeealy an answer.” I pressed again. “YES YES YES of course!! !” she finally blurted out. Tears and hugs ensue. She was completely clueless, dumbfounded, and extremely happy. This was followed by a few priceless phone calls and text messages. I think her phone will need a new speaker from all the screams that were blasted out of it by her friends and family last night. I was able to give my random night proposal and got her back in the process. Thank you everyone for all the well wishes and it’s-about-time’s. Another weekend, another wedding event – ok, it was another weekend long bachelor party. We had a blast “up north”, and we drank enough beer to drive Miller Brewing Company’s stock price up at least 3 points. Last weekend Chad Osborne and Kari Madsen got married. I’ve known Chad since my sophomore year of college. We lived together for two years and have a lot of stories, none of which were suitable to tell at his wedding (you’re welcome Kari). It was filled with fun things to do and great memories. The event was more like a vacation than a stressful wedding. Click more to read the rest of the story. Jacob, Josh, and Christine had a rough week. He was born on Sunday, a few days late. They took him home Tuesday, but had to bring him back in on Wednesday because he had a temperature. The poor little guy had a spinal tap done, and a bunch of blood work, not to mention the circumcision the day before. He is doing great now. He’s on antibiotics and is back at home. Josh was supposed to be a groomsman in the wedding, but the complications with Jacob didn’t allow that to happen. It was OK because they upgraded an usher to groomsman and the wedding went great. Josh and Christine were missed at the wedding but no hard feelings, they have their priorities where they should be, and everyone understood why they were not able to attend. Wedding summary is in the works. My older brother and I are going to be best men at my younger brothers wedding this summer. His bride to be is having her two sisters as her matrons of honor as well. It should be a great time. I’d like to take this time to say Congratulations to Kari who is getting married today. Hope he says yes! You would think it would make you feel flattered to have a girl say to you “I will call off my wedding if you tell me there is even a little chance of us hooking up”, but when it really happens, it just makes you think “Damn she’s fucked up”. 270 miles, a birthday party, 3 weddings, and a street dance. What a hell of a saturday. Today, I recover. My two closest friends are now married. One this past weekend and the other two weeks ago. I was a groomsman in each and am very wedding’ed out. The first was ogre, he was married in Taylors Falls, MN. The second was Josh in Granite Falls on the other side of the state. Granite Falls was the site of a massive tornado attack just weeks ago with much of the town destroyed. The national weather service recorded 5 tornadoes from a single storm system with ratings as high as F4, all of which bared down on this city of 3000. To the elation of the Bride to be, the reception hall and church were left unharmed. Severe weather rolled through my area today and took out most of a town that I will be soon visiting. Visiting for a wedding in fact. Being a member of two weddings in 3 weeks to waaaay to much. Not that I hate dancing or anything, oh wait, I do hate dancing. Does anyone know why they always say “everybody loves a polka”?